Readership Survey results + 4 NEW downloadable items! 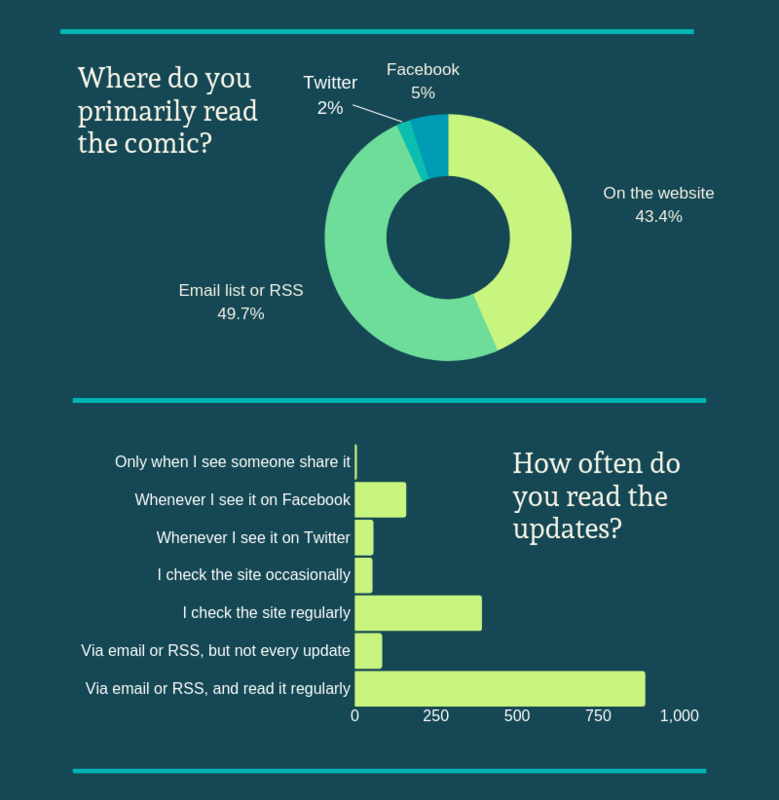 But first — thank you to everyone who participated in the recent Readership Survey. I got over 1600 responses, and they were all very interesting to read through, except for, like, five. You know who you are. I’ll also be drawing three random email addresses to give Roll-a-Sketches to, as promised — if you’re a winner, I’ll contact you this week via the email address you provided! • A lot of you live outside the US, which means shipping costs for merch can get expensive. 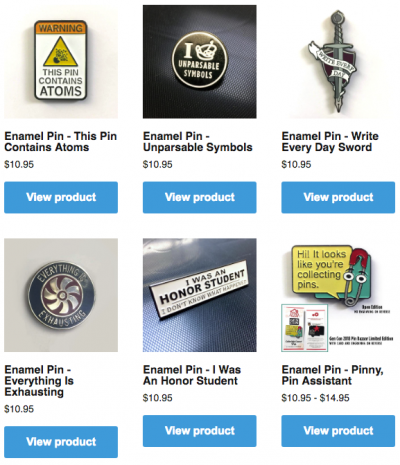 In this post, I’ll share a free worldwide shipping offer on enamel pins — a first step towards solving that problem. 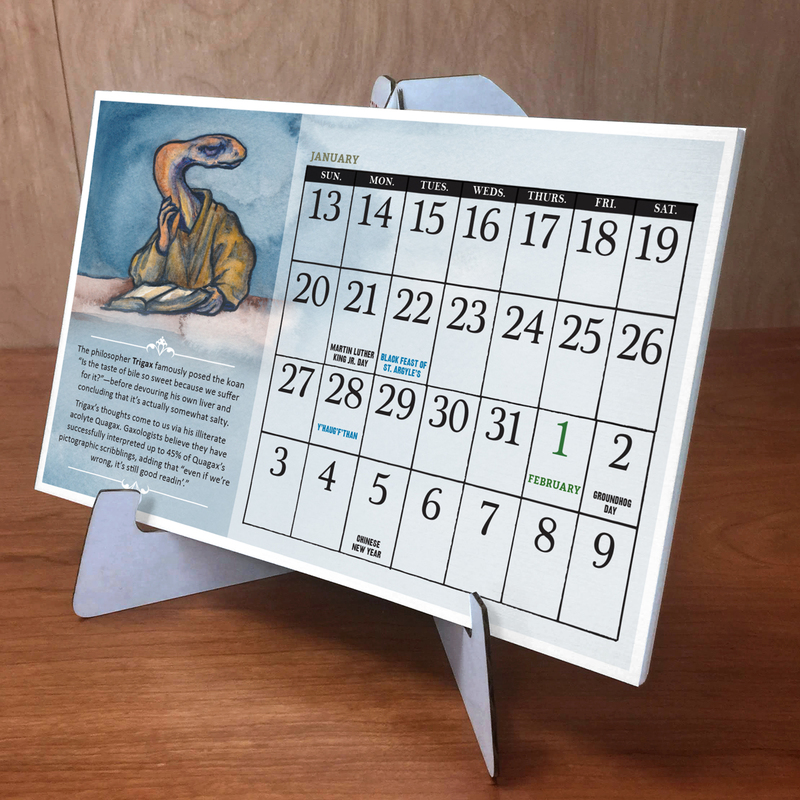 • In addition, I’m introducing a new downloadable print-at-home product: Reissues of the Wondermark Calendars from previous years — with dates updated for 2019, reformatted as PDFs and ready for you to download and print at home. • Based on survey responses regarding Patreon, I’m launching a membership drive for the next two weeks, and as a thank-you gift, the aforementioned calendars will be given free to new and existing patrons! 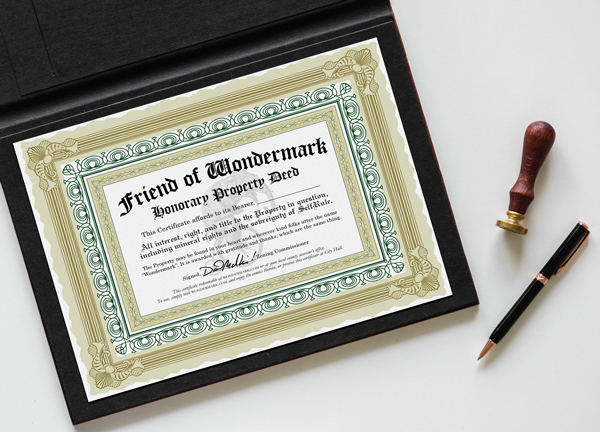 • Finally, if Patreon or any recurring voluntary-support model isn’t for you, I’m also introducing the Friend of Wondermark Certificate, awarded as a thank-you gift to any person who makes a one-time “tip jar” donation. In the survey, I asked a lot of different types of questions, and got a huge variety of responses to consider. Below are some highlights from the data (click each image for a closer look). I confirmed what I suspected: that I’ve got a great audience — a seasoned audience, like a cast iron pan. I’ve got many readers who’ve been around a while. We are all growing old together. 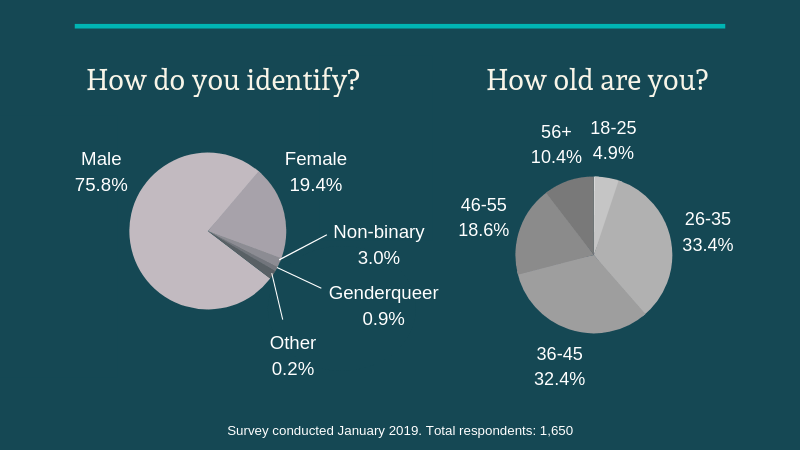 Of course, the survey respondents are a self-selecting data set; but you are the people I care about, so that’s fine. In addition, I was heartened to learn that, even in this age of social media, quite a few of you still visit the website directly (either manually, or by clicking a link in a feed). This makes sense, if a lot of you have been reading since before everyone got buried up to the neck in algorithmically-derived content feeds! That data point gives me some actionable intelligence: I’ve been meaning to work on revamping this website for a long time, to include mobile responsiveness, and comic searching, and storyline tagging, and other features of that nature — and now I know I should make that a priority. I was also chuffed to see how many of you I recognized, not by name or email, but because you told me that you were the person who won this contest or that, or participated in this project or that. Many of those instances were a decade or more ago, and I’m so thrilled that you’re still here, still watching me do this dumb thing. Feel free to come say hello — I hang out there myself when I have the time, and you can give me more feedback there directly, if you like. Or talk behind my back when I’m not there! How would I ever find out?? The revamped website I just mentioned is something that increased Patreon support can help accelerate! 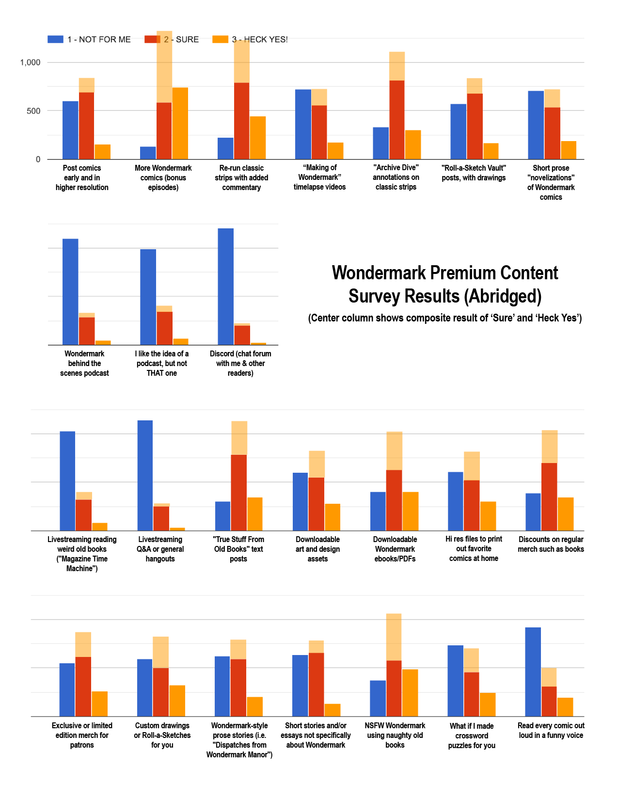 This chart below is the ostensible purpose for the survey — it shows the responses to my question about what kinds of premium content would be most interesting for patrons. While more content is always cool, I think (the vast majority of) my comics should always stay free. I have already done the occasional bonus comic for patrons, though. As I mentioned above, I learned that a lot of you live outside the US, which makes shipping costs a big factor when it comes to merch. For a limited time, I will ship you enamel pins anywhere in the world for free. I’ve even already paid the VAT, for orders shipping to the EU. 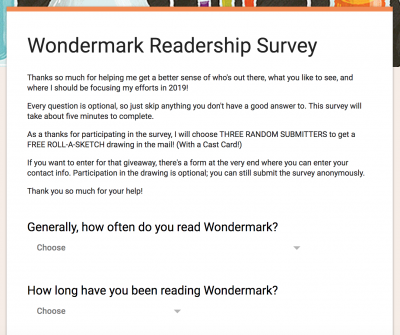 In the survey I asked a bunch of questions about Patreon, of course — for instance, I asked how many of you would be interested in becoming a voluntary supporter of Wondermark for a couple bucks a month. Some of you weren’t into the idea. That’s fine. I’m gonna talk about it anyway. This is a growth year for Wondermark. I’ve got some cool ideas that I’m really excited to work on this year! But traffic is a little down, since a lot of people do confine their entertainment browsing to social media. And I decided that I hate subjecting us all to ad trackers and everything that goes with them, so I removed all third-party advertising from this site. Advertising was never a great revenue stream for me, but it was somewhat of one. Now, though, I’ve manually upgraded all of you to an ad-free website experience — not just those of you who (like me) use adblockers. With respect to replacing that revenue, well, I’ve got the new book collection coming out in the spring, and my usual convention appearances in spring and summer…but income bursts like that are sporadic, and it’s much easier to do long-term planning when you have something approaching a month-to-month predictable income. That’s why I’m focusing my attention on Patreon this year. It works just as well for folks who want to see premium content as it does for folks who don’t care about that and would rather “set it and forget it” and go about their merry way with a warm feeling inside. Many of you have already supported me in a different way — by buying merch, for example. That’s amazing and I’m very grateful! Making all kinds of things for people to enjoy is part of the job, after all. Again, I begrudge no one for feeling like pledging on Patreon isn’t something they can or would care to do! The regular comic strip will always be free, as I mentioned above, and I hope I can keep entertaining you for free forever. But I was interested to learn that a fair number of people were willing to consider the idea of Patreon. If you count yourself in that category — if you’d be open to chipping in a few dollars a month, either because you want to tip me for the content you enjoy, or because you want to access the various bits of premium content that I post to Patreon — there’s no better time than the present. 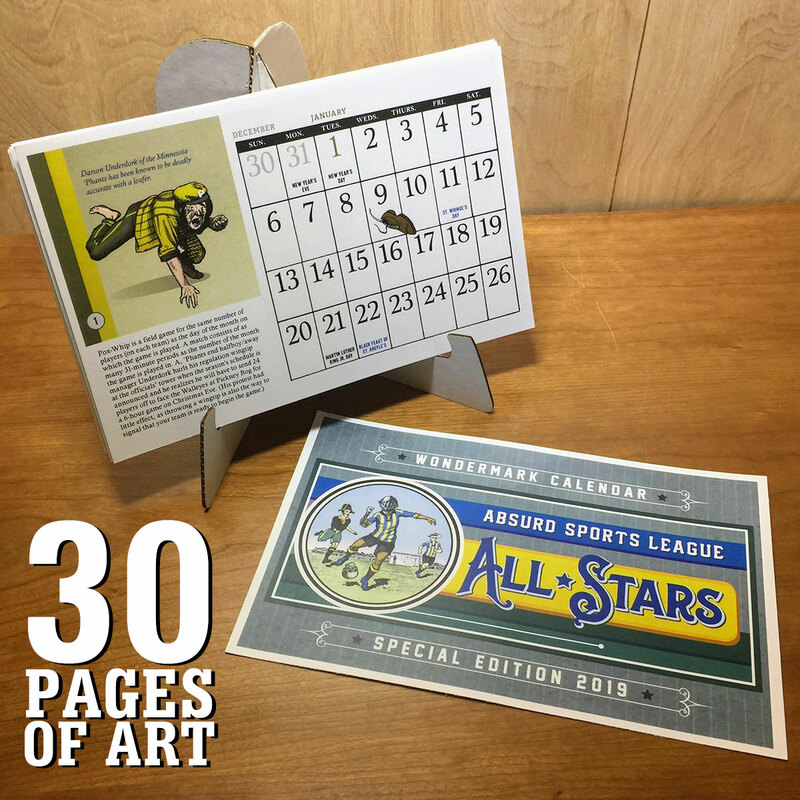 Anyone at the $5-per-month pledge level or above on February 15th will get a FREE download of THREE DIFFERENT Wondermark desk calendars to print at home. This includes current and new patrons both, of course! The download links will be sent on the 15th to anyone in the $5 tier or above, whether it’s a new pledge or an existing pledge. But wait — desk calendars? Aren’t we done with the Wondermark Calendar this year? Each year, as you know, we do a special Wondermark calendar on a specific theme. Two hundred forty-nine of you have this year’s edition already! But I’ve got years of calendars in the can over here that not more than that many people have ever seen. So I’m reissuing the 2013, 2015, and 2017 calendars, updated with 2019 dates. 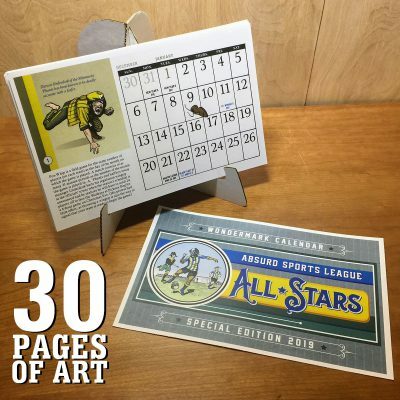 I’m hoping this might be of interest to folks who don’t have the budget for the premium printed calendar, or who live in expensive-to-ship-to places, but who’d still like to see the content that was released in prior years, which I’ve never reprinted anywhere since. Or just folks who missed them the first time around! You can download the PDF, print it out at home, and have a Wondermark calendar! Or if you don’t need a calendar, then you can have a weird book with 30 pages of art and jokes and some numbers on the side you can ignore! That’s pretty cool too, I guess! I’ve reformatted each calendar from the original editions so each individual page now shows four full weeks rather than two (replacing the multiple-narrow-pages model). This means the dates on each page overlap with the previous page, so you still cycle through pages every two weeks to keep bobbing today’s date to the top, and therefore can still always see at least two weeks ahead. It makes sense when you see it, I think. 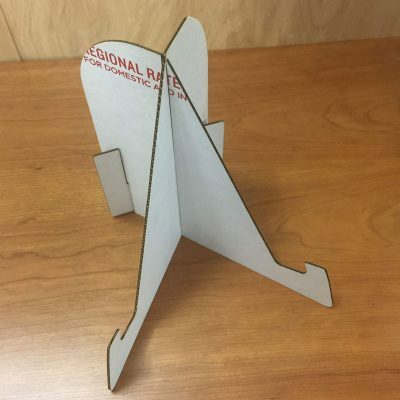 I’ve even included instructions for making your own desk easel out of cardboard. 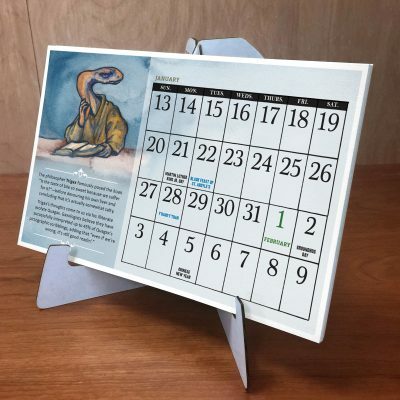 Or you can use an old Wondermark calendar stand, if you have one; or any ol’ book stand or easel; or even just a nail in the wall (if you don’t mind wielding a hole punch — I’ve also included a template for getting it properly centered). 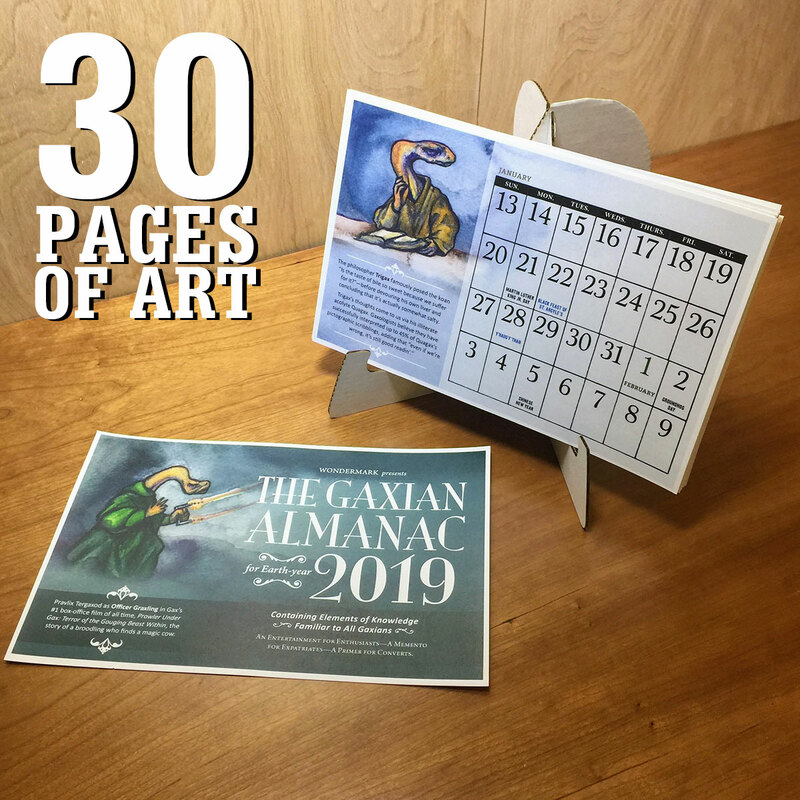 So, if on February 15 you’re pledging on Patreon at the $5-per-month level or higher, you’ll get a download link for any (or all) of the three reissued calendars: The Gaxian Almanac; The Concert of Conscience; and the Absurd Sports League All-Stars. 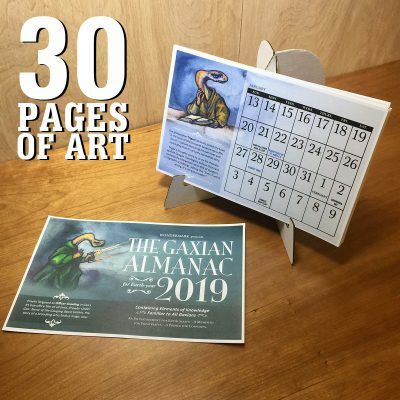 The Gaxian Almanac (originally released in 2013) – Whether you’re a visitor to planet Gax or an expatriate longing for home, this collection of useful bits of Gaxian history, etiquette, and culture is an invaluable companion. Learn why Gaxians habitually devour their own mothers, and marvel at the first Gaxian to bicycle down a volcano! Enjoy this beautifully watercolored tribute to one of the galaxy’s smelliest species. The Concert of Conscience (originally released in 2015) – Many years ago, in a hall long since demolished, there was a concert which affected all in attendance in profound and maddening ways. The pages of this calendar are the only known account of what occurred, and even its veracity is suspect. 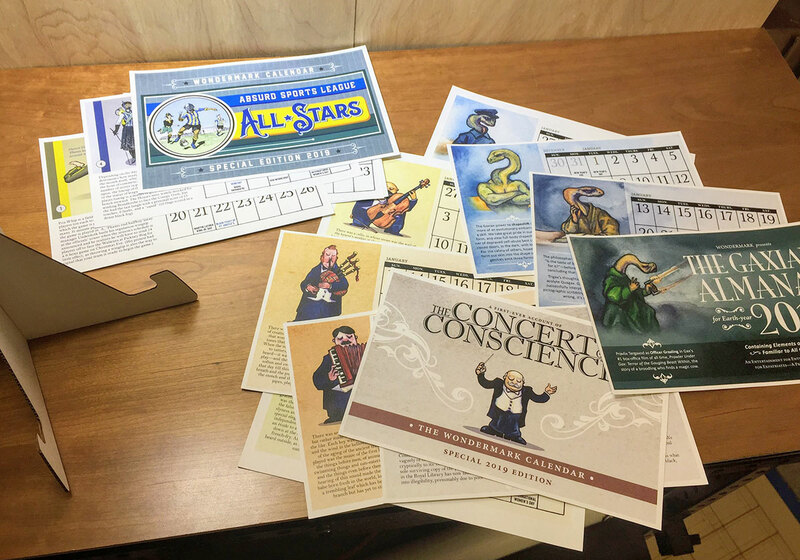 From A to Z, each player and each instrument are profiled in these pages, and the uncanny effect of their playing is described. Be one of the few to know what really happened on that cold night long ago—a night dark, without any stars. Absurd Sports League All-Stars (originally released in 2017) – How much do you know about Pox-Whip, the Many-Named Game, also known variously as Flea-Ball or Loud Checkers? It takes an entire year to explain all its rules, regulations, and customs, many of which contradict each other—but luckily, some of Pox-Whip’s most popular athletes are here to demonstrate the finer points of professional play. Even if you don’t yet know a sally from a stove, this All-Star collection will show you exactly why Pox-Whip is on its way to becoming the world’s most popular sport among weirdos. No shipping required, just a little trimming once they’re printed out. The pages are sized to work on either US letter paper or A4 paper. Or, if you don’t want to pledge, you can also buy any of the PDFs directly, right now. 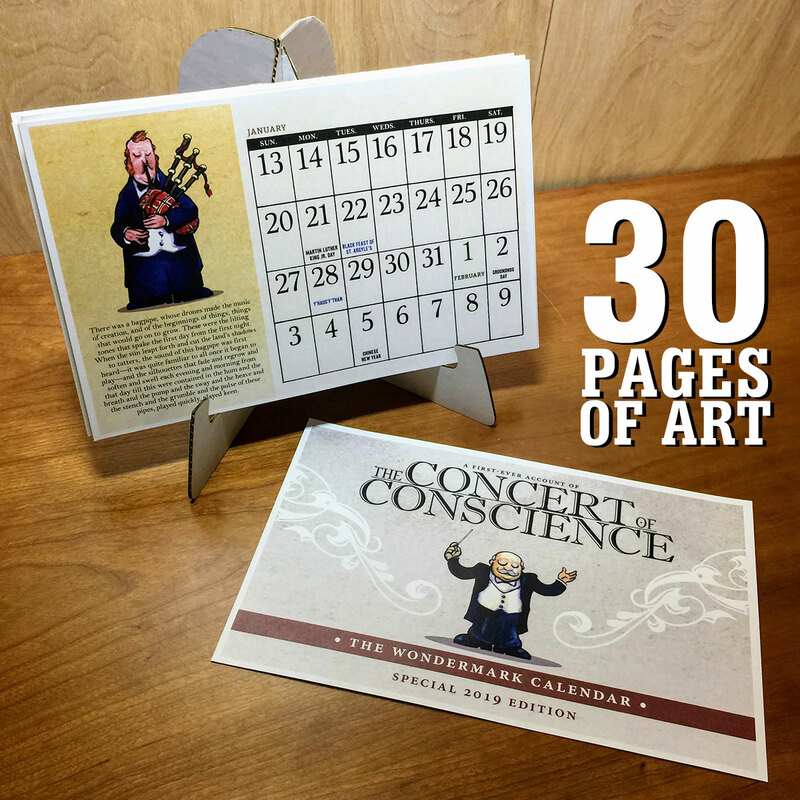 Check out more pictures of the new calendars here. Finally, I heard from lots of you that you don’t want to use Patreon. You don’t want to sign up for anything. Yet you’d be willing to support me and the work I do, if only it were simple. Some of you asked for a direct PayPal donation link. Here you go. But PayPal’s not for everyone, either. Besides, if you’re kind enough to want to support Wondermark voluntarily, I’d like to give you something in return. So I’d like to make you a Friend of Wondermark. I’ve set up a tip jar on my online store. You can tip any amount you like, and I’ll send you this downloadable Friend of Wondermark certificate that you can print out, and display proudly among your many other credentials and honors. It legally awards you mineral rights to the kindness in your own heart. • Want enamel pins? I’ll ship them anywhere worldwide for free (if you get 2 or more). • Willing to become a sustaining member and pledge $5 to Wondermark monthly? Join or upgrade by February 15th, and on that date I’ll send every patron all three downloadable Wondermark calendars. • Just want one of the downloadable calendars now? 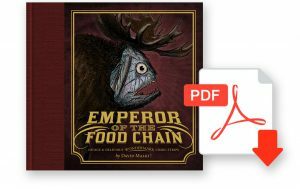 Buy the PDF directly. • Just want to throw in a tip? I’ve got PayPal, or, contribute any one-time amount and become a certified Friend of Wondermark. This sure was a long post! But I hope you’ll forgive me: I was so excited to get all your great comments and feedback, and maybe I went a little bananas with new ideas. I’ll be yammering about this until-February-15th thing a few more times between now and then — you understand. If you’ve already pledged, or have already decided that it’s not for you, then just assume we’re good and tune me out. Again, to my pals on a budget: I’m right there with ya. There is no obligation to contribute anything; the comics will always be free. To my pals who’ve bought merch: you’re my heroes too. So if you do want to contribute something anew, and help subsidize the comic for everyone else to enjoy for free, I hope there’s something in this post that interests you, no matter the particulars of your preferences. projects and content, instead of paying vendors and buying materials and postage. And if you do contribute, thank you so much! You’re not just a Friend of Wondermark — you’re my friend, and that can’t be bought. Except with any sort of financial contribution, as described at length in this post. Tags: blog: product announcements, blog: reader participation | Comments Off on Readership Survey results + 4 NEW downloadable items! The first-ever WONDERMARK READERSHIP SURVEY ! I’ve made a READERSHIP SURVEY! I would love it if you would contribute your thoughts! UPDATE: Thank you very much, I have all the responses I need for now! It will take about five minutes to complete. And as a thank-you for participating, I’ll randomly draw three email addresses of folks who submit the survey, and send them each an original Roll-a-Sketch drawing in the mail! Real talk, here: now that I’m starting to come to grips with the time tradeoffs that parenting a toddler requires, I want to be able to focus my energies where they will be the most effective creatively. This survey will help me prioritize some of my creative plans for the coming months! As well as figure out what kinds of rewards to offer when I introduce new tiers on Patreon, which will happen very soon. Thank you very much for participating! It will help me out a ton! 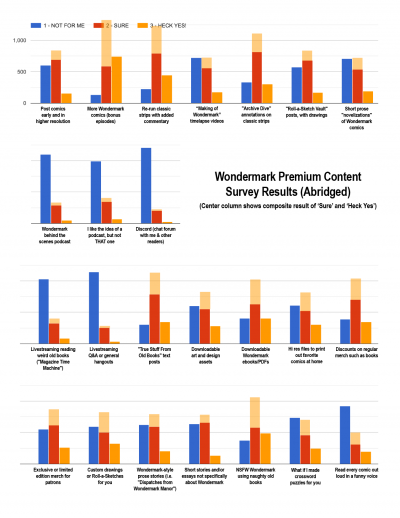 Tags: blog: reader participation | Comments Off on The first-ever WONDERMARK READERSHIP SURVEY ! Earlier this week, I streamed the making of a Wondermark comic on Twitch! It was a little experiment to make sure I had all the technical stuff figured out for streaming—the infrastructure for it has come a long way since the last time I streamed regularly, let me tell you. One of the things I’m interested in starting (perhaps as a bonus for subscribers on Patreon) is regular livestreams, and one of those regular streams will be called Magazine Time Machine. On every different computer I use, I’ve got about ten open tabs of old books and magazines that I would LOVE to browse through and read and share, but just haven’t been able to dedicate any otherwise-unallocated time to. This Friday, January 18th, changes that! At 12 noon Pacific time / 3pm Eastern time / 8pm GMT, I’ll be live on Twitch reading you VICTORIAN CHILDREN’S BOOKS. 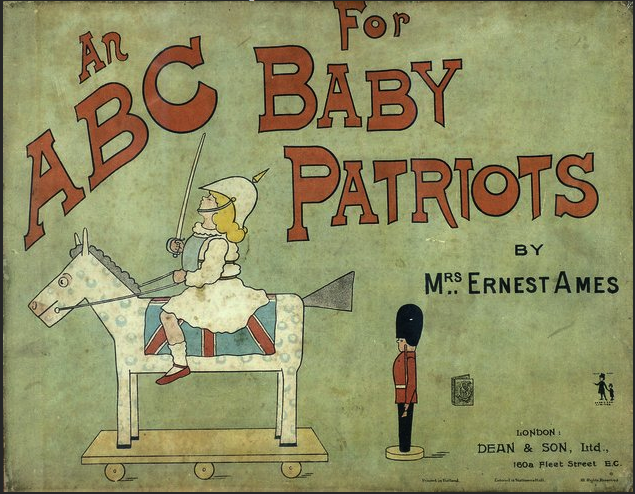 We’ll start with 1899’s An ABC For Baby Patriots (pictured above) and see where that leads! For maybe an hour or so? We’ll see how it goes! Hope to see you there! UPDATED TO ADD: It was great! You can watch the video on Twitch, if you like — it’s a little less than an hour and a half. Reaction to our current story arc (which starts here) has been fascinating to see! Thank you for the many kind (and even the few less-than-kind) emails. 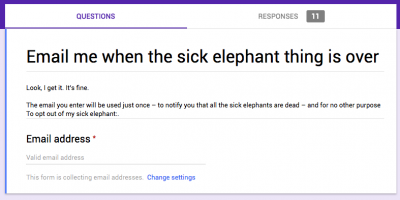 And for your own sick elephant suggestions — though I am perfectly well stocked, believe you me. I know this has been going on for a while. And I assure you that this plane is on a gradual and appropriate glide slope to its narrative conclusion. What does this accomplish? WHO CAN SAY. 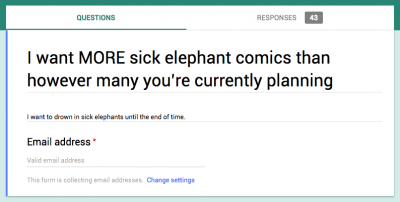 Maybe, at some undefined future point, elephant fans might get something special in their email! THE WORLD IS UNCERTAIN. Our Kickstarter campaign for the new book is proceeding apace! Thank you to everyone who’s reserved a copy so far, I am very excited for you to get it in several months. If we beat our funding goal, any extra money raised will go toward making everyone’s book longer, with more comics included – so please spread the word! The new book will not, alas, contain any sick elephants; the contents come from a bit farther back in the archive. This is so interested parties can see firsthand what a Wondermark book is like, without me giving away too much of what’ll be in the new book! You can download the book even if you don’t back the project — it’s just a “thank you!” from me for visiting the campaign page. Wondermark Q+A: Pose your questions! Let’s pull back the curtain a bit! I’d like to do a mailbag style post where I try to answer any BURNING QUESTIONS you might have, about Wondermark, or my other work, or anything else you might be interested in. 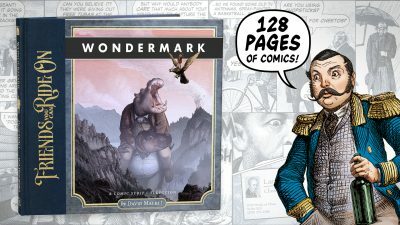 For maximum visibility, I’d prefer you leave your question on the Wondermark Facebook page, but if you don’t have Facebook or prefer not to post there, you can also comment here on this post and I’ll see it. I’ll do a question & answer roundup in a future blog post! And if you see someone else posting a question you’re interested in, like it (in the FB comments) or upvote it (in this post’s comments). Happy Thanksgiving weekend, Americans! I’m thankful for ALL OF YOU. I mean it sincerely! 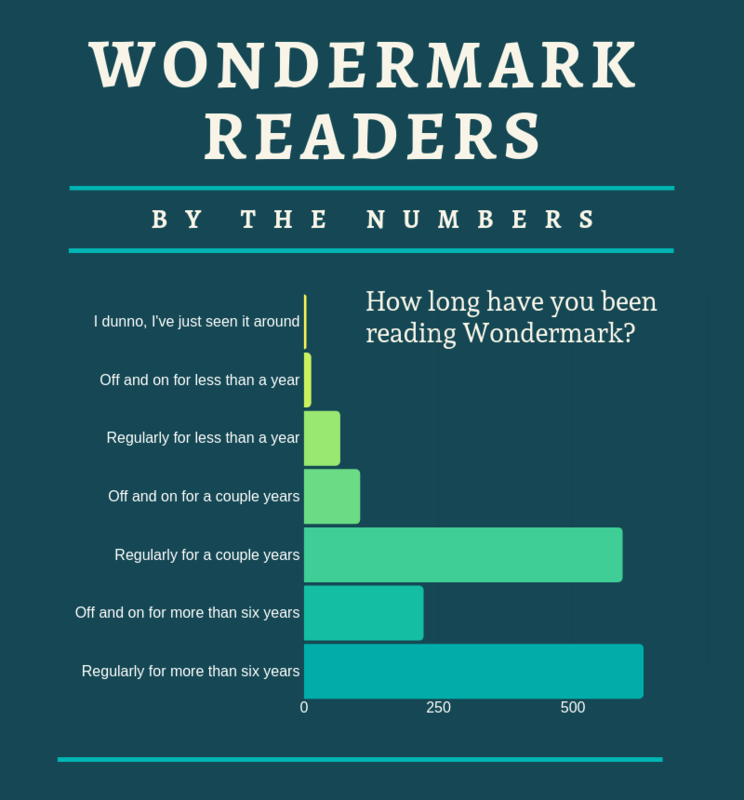 Tags: blog: reader participation | Comments Off on Wondermark Q+A: Pose your questions!